A 5 year old girl is brought to the emergency department as she is unable to walk. The day before she had started to become unsteady on her feet. Since then she has got progressively weaker. The child has flaccid paralysis of all limbs and absent knee jerks. She is having difficulty clearing secretions and is obtunded; she rouses to voice. Examination of the eyes reveals that her pupils are equal and reactive to light, but she has nystagmus. On further inquiry, the child’s mother mentions that they attended a picnic in bush land near Sydney a week previously. A high index of suspicion is required to make the diagnosis in cases of ataxia or paralysis where patients are from, or have visited, regions where the causative species are endemic. Q2. What are the causative organisms and where are they found? The photo shows an engorged hard tick Ixodes holocyclus. These ticks are confined to the bush and scrub lands near the eastern coast of Australia, from North Queensland to Victoria. Tick paralysis has also been reported in Tasmania. There are less than 5 cases of severe envenoming each year in Australia. There have been no deaths since 1945 and the advent of improved respiratory support, but tick paralysis has accounted for more deaths than either the red back spider or the funnel web spider in Australia. Both male and female adult ticks attach onto humans. They do this by ‘questing‘ — they climb up vegetation waiting for host to pass by. Natural hosts in Australia include bandicoots, koalas, possums and kangaroos. Q3. What are the usual clinical manifestations of this condition? there may be local itch and swelling at the tick attachment site. Local nerve palsies (e.g. CN7 palsy) may occur in proximity to the tick attachment site. Allergic reactions may occur. systemic toxicity is heralded by a nonspecific prodrome of ataxia (unsteady gait) and drowsiness or lethargy. a progressive ascending symmetrical flaccid paralysis occurs over a period of days. eventually cranial nerve palsies occur — typically ptosis, extraocular palsies, CN7 palsies, dysphagia and impaired airway reflexes. death may result following the onset of respiratory paralysis. Severe toxicity and death is usually seen in children under the age of 3 years. Q4. What mediates the systemic toxicity? 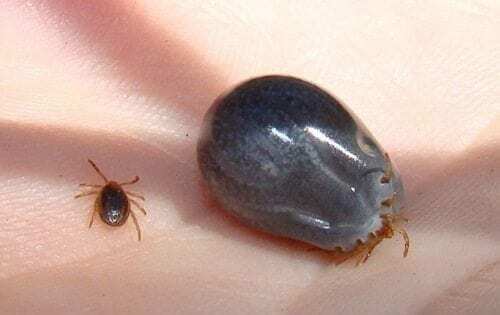 Ixodid ticks contain neurotoxins in their saliva, in addition to various agents that modulate the hemostatic and inflammatory responses of the host. In the case of I. holocyclus, the neurotoxins are ~ 5 kDa proteins known as holocyclotoxins. These toxins appear to impair acetylcholine release from presynaptic nerve terminals. Q5. How is the causative organism removed? Use fine forceps or suture material to grasp the tick’s mouth parts close to the skin at the site of attachment. Remove the tick, with mouth-parts intact, by carefully applying steady traction. Don’t worry about twisting clockwise or anti-clockwise! There is controversy about whether the tick should be killed before removal, due to concerns about toxin release during removal. More important is to ensure that there are no retained mouth-parts, which may lead to granuloma formation. Q6. Can clinical deterioration occur following removal of the causative organism? 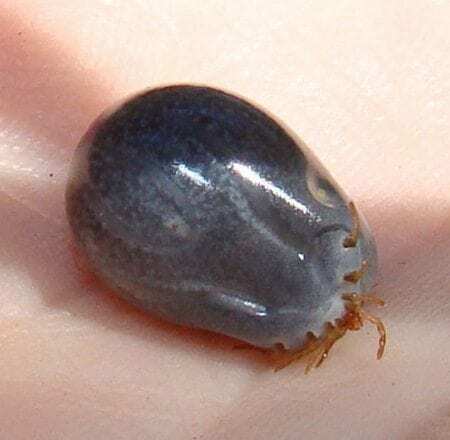 In the Australian setting, paralysis may progress for about 2 days following the removal of the tick in the symptomatic patient. The asymptomatic patients does not need to be admitted for observation following the removal of a tick! Q7. How is this condition managed? Intubation and ventilation may be required, and once performed is usually continued for day to weeks. Q8. What is the role of antivenom? CSL Tick paralysis antivenom is no longer available for use in humans. 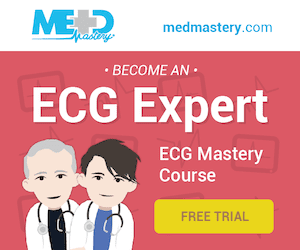 Patient survival can be ensured by meticulous supportive care and ventilatory support. Brown AF, Hamilton DL. Tick bite anaphylaxis in Australia. J Accid Emerg Med. 1998 Mar;15(2):111-3. PMC1343038. Edlow JA, McGillicuddy DC. Tick paralysis. Infect Dis Clin North Am. 2008 Sep;22(3):397-413, vii. PMID: 18755381. Grattan-Smith PJ, Morris JG, Johnston HM, Yiannikas C, Malik R, Russell R, Ouvrier RA. Clinical and neurophysiological features of tick paralysis. Brain. 1997 Nov;120 ( Pt 11):1975-87. PMID: 9397015.